"EVERYONE SHOULD BE DELIGHTED AT THE OUTCOME THOUGH AS I BELIEVE ALL PULLED TOGETHER JUST BY BEING IN ATTENDANCE, BODIES WAS THAT ALL WAS REQUIRED." THE HEARING ON THURSDAY WAS ABANDONED, I BELIEVE BECAUSE WBC COULD NOT DISCLOSE ANY PROOF OF OWNERSHIP, AND I WOULD ALSO DECLARE THAT NO LAWFUL OCCUPATION IS THEIR'S (NO LOCUS STAN-DI). THE REAL REASON BEHIND THE DISCONTINUANCE HAS NOT BEEN MADE CLEAR TO ME, AND AS COUNCILS AND PINS ARE PIG IGNORANT, WE WILL NEVER KNOW UNLESS THAT IS OF COURSE WE GET TO A FULL COURT HEARING. THEIR FULL DISCLOSURE WILL BE REQUIRED, AND WITNESS SUMMONSES WOULD BE ISSUED. EVERYONE SHOULD BE DELIGHTED AT THE OUTCOME THOUGH AS I BELIEVE ALL PULLED TOGETHER JUST BY BEING IN ATTENDANCE, BODIES WAS THAT ALL WAS REQUIRED. BECAUSE WBC HAVE OBTAINED A LAND REGISTRY DOCUMENT, WE MUST NOW HAVE DISCLOSED TO US "HOW". THE NORMAL ROUTES ARE THROUGH PRE-REGISTRATION OF TITLE DEEDS, BUT WE KNOW, WELL I KNOW THEY HAVE NONE, SO THE SECOND WAY IS THROUGH A "STATUTORY DECLARATION", THIS I HAVE ASKED FOR, BUT NO RESPONSE. I AM PREPARED TO ACT AS THE COMMONERS REPRESENTATIVE AND FOLLOW THIS THROUGH AS FAR AS IS NEEDED, THIS WAY NO FURTHER CLAIMS TO RIGHTS OTHER THAN THAT OF THE COMMONERS AND PUBLIC RIGHTS OF ACCESS SHALL WILL BE LAWFUL. AT THIS POINT, MAY I MAKE A SUGGESTION THAT THE RIDERS AND PUBLIC WORK WITH EACH OTHER TO DEFEAT ALL CLAIMS TO OWNERSHIP BY COUNCILS AND SO CALLED CONSERVATIONIST BE FOUGHT WITH VIGOUR? THE FUNDING, GIVEN TO WBC BY NATURAL ENGLAND MUST BE RETURNED BACK TO THE PUBLIC PURSE. Report by Jane Meredith for Newburytoday. A PUBLIC inquiry into proposals to fence off part of Padworth Common for livestock grazing was adjourned this morning (Thursday), after a Government planning inspector discovered recently amended documents, submitted by the applicants, West Berkshire Council, had not formed part of a public consultation on the issue. After the inquiry opened at West Berkshire’s Council Chamber at 10am today, inspector Alan Beckett, who is overseeing the inquiry, was informed by several of around 20 objectors at the inquiry that details submitted with West Berkshire Council’s planning application for the 23-hectare site had recently been amended. The new details – which Mr Beckett said he himself had only noticed this morning – included increasing the amount of fencing, from an original 3,158m specified in a September 2011 application, to a total 4,032m and a reduction of the amount of gates allowing access onto the common, from 17, to 14. Objectors then pressed for the four-day inquiry to be adjourned, after pointing out a public consultation on the issue prior to the inquiry had been rendered ineffective as members of the public were oblivious to these changes and had not had chance to comment on them. Objectors also pointed out there were ongoing issues on commoner’s rights, which were currently part of a legal process and awaited resolution. Summing up, Mr Beckett said that in the interim West Berkshire Council must post notices on the common and in the press informing the public about the proposals, and in particular details of the current plans, to enable the general public to see where the fencing would be erected. The inquiry was adjourned until Tuesday, January 15 and is set to last four days at a venue close to Padworth Common but which yet to be arranged. 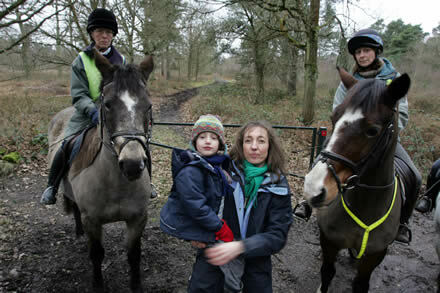 Pictured: Objectors at Padworth Common earlier this year. "I should have advised him to always beware of old ladies"
Good to see everyone in such good spirits. Excellent piece of team work I thought particularly from Steph. I had to laugh because the Inspector obviously knew me from somewhere but couldn't quite place me, that was until he walked right by me near the end. Then his smile visibly faltered but he soon picked it back up again. You see he was the blighter that did my last PI and got all cosy with the Council. He fined me £2,000 for providing too much evidence.!!! Naturally I did not leave it at that but complained to PINS and then to PINS CEO, Sir Mike Pitt and then to the Parliamentary Ombudsman so no doubt they gave him a good going over. He should be pleased that he erred on the side of caution today. I had a chat with Paul Hendry and he is going to answer the questions in the letter which I hope Mark has handed to the Inspector. In passing he did confirm that WBC do not own the common but have a responsibility for it. Agreed that it was 'vested' not owned. This fact is important because only the owner can apply for enclosure. Others have to apply to the Secretary of State via Defra NOT PINS. Hopefully by the time this gets anywhere the HLS will have disappeared with any luck. The Commoners now know that as they are the only people with an interest in the soil they will be impossible to beat or should be if the law is anything to go by. Their interests must be paramount. Our thanks and no doubt you have the Audit Com in mind re the unlawful use of public monies.